I haven't had much time for building this year so I'm going to declare my London-style hat shop done (even though it still needs some work here and there). I'm posting it and adding it to my modular street. The first floor is hat shop. The black tiles on the sides are chalkboards for daily advertisements. I may create stickers for these in the future. Right now there is a sale on pith helmets (which are wonderfully stackable). You can't really see in this photo but the mirror piece from the detective office is built into the dresser with the clock. Upstairs is a small apartment with a bedroom loft reached by ladder. Thanks for looking! More photos can be seen on flickr. What a lovely building! I especially like the brown and white front of the first floor and the flower pots right in front of it. How did you build them? I really like the wallpaper,hey I'm an aussie and green and gold are our olympic sporting colours. I also love the drain pipe and the use of a column piece for a lamp shade. Nice! I alway like a hat shop. A pity there aren't that many around. The shop looks nice and with a great variety of hats. I am only missing a bowler hat. Very fun looking build and a nice inclusion to any town. Well done! Very nice model. Even though it is not massive it has got lots of character. I love the wallpaper! 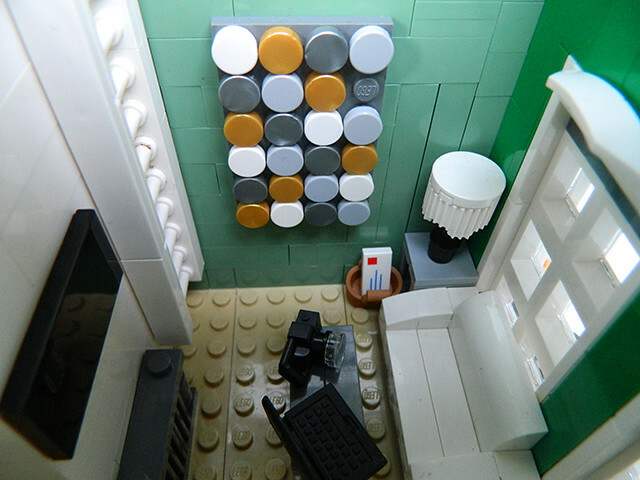 I love the display window on the ground floor, clever use of the headlight bricks. This is like one of those suave shops in Savile Row. 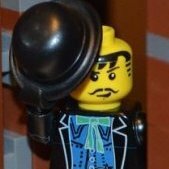 Actually there is a bowler hat you just can't see it from a top view. It's inside the display case under the middle counter. Thanks! The flower pot is made with a vintage technic wheel hub, two dishes, a bit of hose, a tile with a stud and a bouquet. Soooo many fantastic things about this MOC! I really love the colours you've chosen for the roof - looks far more realistic than if you'd used a single colour. Excellent! I don't know what else to say, but I love it. I have a soft spot for 16 wides and yours is splendid. Clean facade with great woodwork, awesome interior.. Good stuff! This modular looks amazing with the color scheme you used. The whole facade is beautiful. I love the small details you incorporated into your build, e.g. the flower pots, the wallpaper, the guardrail. By the way, your library facade is splendid, too. The upper floor facade looks interesting, too. 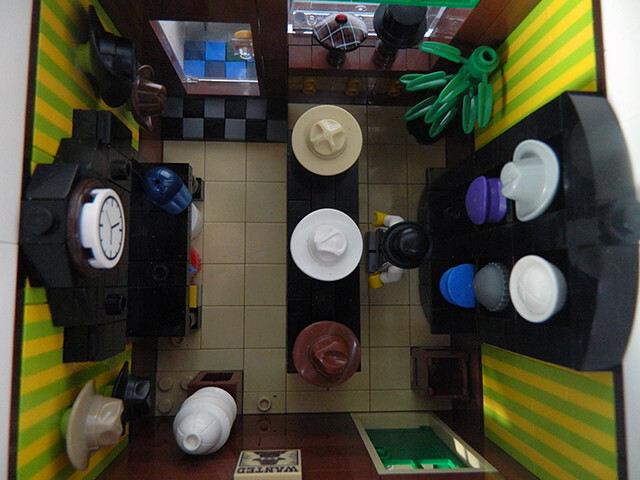 This also takes me back a bit, as my first-ever modular MOC was also a hat shop. Looks really good. Nice interior as well. I love the wooden shop front and the shop interior. Very nice modular! Nice idea for a shop, and nice apartment, love all the small details that are everywhere.